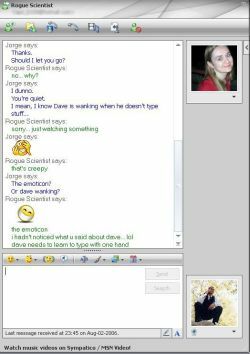 Ah, 2007’s first MSN conversation. Actually, it’s somewhat of a ploy. This conversation is actually from last year. I’m just getting around to posting it now. In fact, I have a few conversations stored up, so I will at least have something to post on a rainy day. sounds like you have many an interesting conversation …lol I really like your icons ! I won’t even dignify this will a comment.